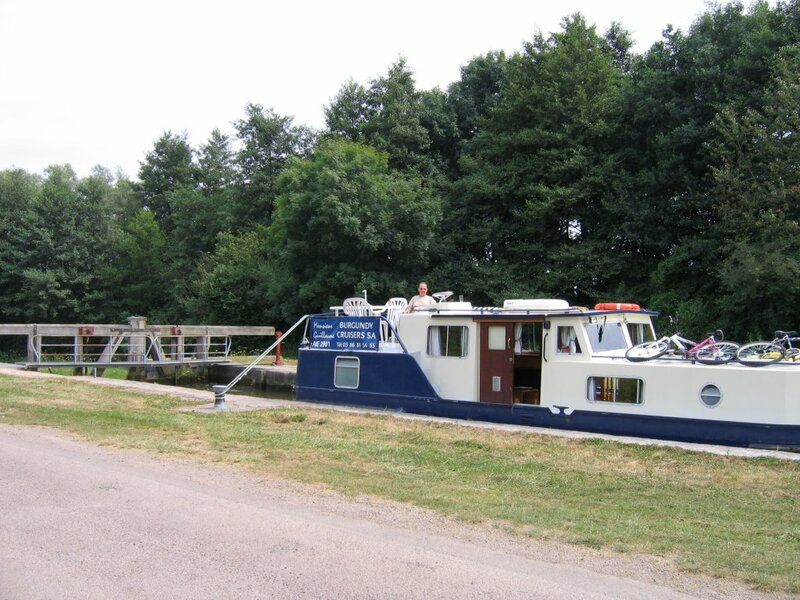 From 26th July to 2nd August we hired a boat on the Canal du Nivernais in the Burgundy region of France. Here are a few comments & pictures of the trip. We arrived at the hire base around 4:30 in the afternoon after driving down from Dunkerque. The temperature was in the low thirties and we felt a bit hot, sticky & tired. 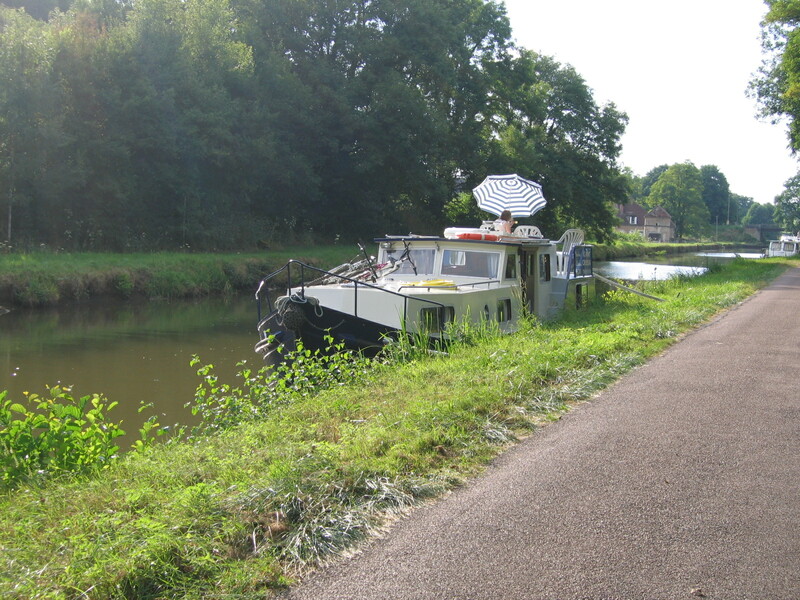 The base at Marigny-sur-Yonne is run by an English couple who live on a narrowboat on site. It seemed a bit odd coming all this way and seeing a narrowboat. They showed us round the boat, we did the paperwork, loaded our stuff and set off. The boat was a British built Euroclassic by SW Durham Steelcraft (http://www.leskerne.com). It looked pretty impessive but, as we were to find out later, not very easy to control! There was a lock only a hundred metres or so away and so we met our first eclusier amost immediately. We stopped for the night at Chitry-les-Mines. The next day we started up a long flight of locks to the summit. We were accompanied by a French family on a Crown Blue Line hire boat. Almost all the boats we saw during the week were hire boats, either from Crown Blue Line, or from Locaboat. At the locks the eclusier (lock keeper) does most of the work, but they appreciate help if they are on their own. The paddle gear is similar to at home, but the handle is permenantly attached, no need for a windlass.There were no ground paddles, gate paddles top and bottom gates. Most gates were metal with no balance beams, but there were a few traditional wooden ones with balance beams. The eclusiers insist that you use ropes both fore and aft, whether going up or down. There are three or four large bollards on each side of the lock. 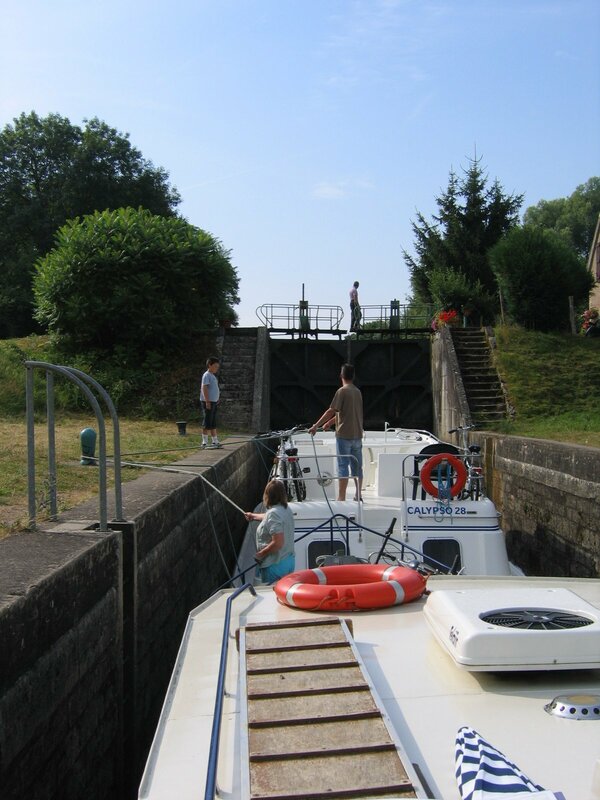 We became preety good at lassoing the bollards as we entered the locks. If going into an empty deep lock we would hand the ropes to the eclusier, who looped it over the bollard and handed it back.